with his March to the Sea! William Tecumseh Sherman attended the U.S. Military Academy at West Point and graduated near the top of the class. He was an outstanding military strategist, but gained infamy for harsh tactics and widespread destruction. General Sherman commanded armies at the Battle of Bull Run, Battle of Shiloh and the Battle of Vicksburg; however, he never commanded in a major Union victory, and his military career was erratic. Perhaps General Sherman is most remembered for his infamous march through Georgia, the March to the Sea campaign, to split the Confederacy. His strategy was to capture Atlanta, Georgia's largetst city and the South's major railroad terminal, and then move southeast to Savannah, a major port along the Southern coast. General Sherman kept his most seasoned veterans and sent other soldiers to Nashville, Tennessee, to be under the command of Major General George Thomas. 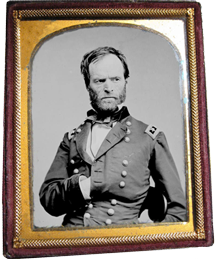 Attempting a quick, decisive victory in the 1864 struggle for Atlanta, William Tecumseh Sherman’s cavalry wreaked havoc in the countryside around the city. Sherman's Horsemen tells the story of Sherman’s raids and the day-by-day life of the Yankee horse soldier. 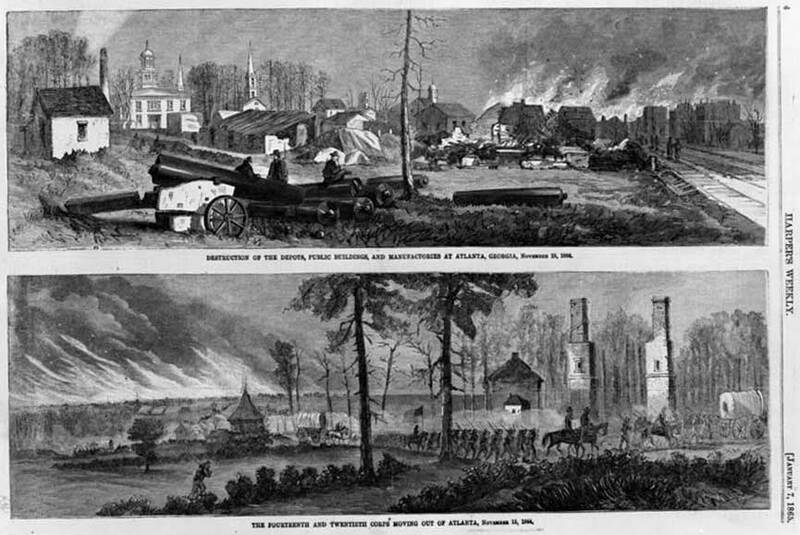 Destruction of the depots, public buildings and factories, Atlanta, Georgia, November 15, 1864. Prior to leaving Atlanta, he set fire to munitions factories, railroad yards, clothing mills, and other Confederacy resources. However, the fire spread throughout the city. Some historians believe the fire got out of hand, while others believe the devastation was planned. General Sherman marched 285 miles to Savannah, Georgia, a major seaport at the time, destroying anything that could be used against him or help the Confederates. 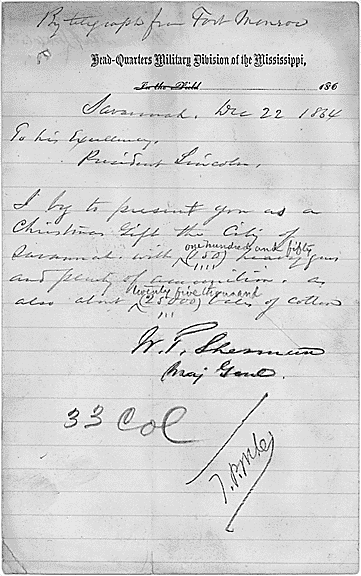 On December 23, 1864, Sherman sent a telegram to President Lincoln stating that he was presenting him the city of Savannah as a Christmas gift. After capturing Savannah, General Sherman's troops turned north, following the coastline through the Carolinas. 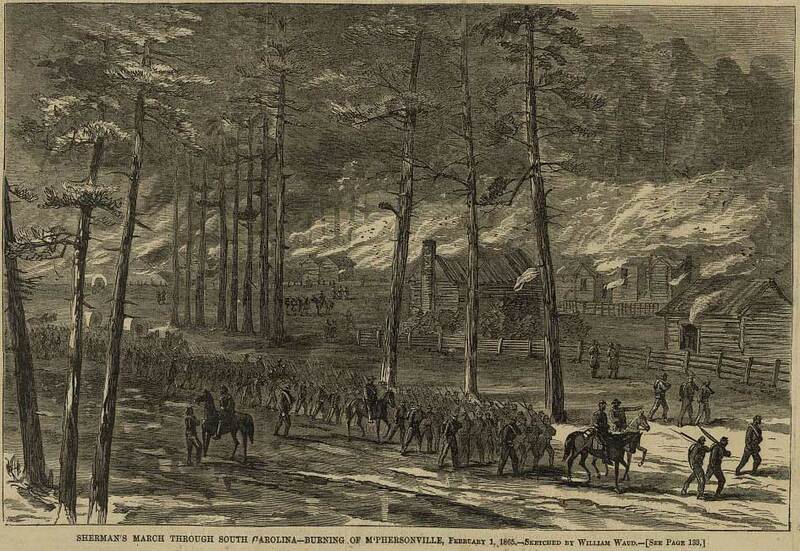 Burning McPhersonville, South Carolina, February 1, 1865, illustrated by artist William Ward. In North Carolina, Sherman's troops engaged those of General Joe Johnston. As General Robert E. Lee surrendered to General Ulysses Grant on April 9 in Virginia, about a week later, General Johnston surrendered to General Sherman on April 17, 1865, at Raleigh, North Carolina. Though writing in a personal letter that he was sick of fighting, General Sherman was promoted and given command of the armies in the western United States, covering the area between the Mississippi River and the Rocky Mountains. His focus was to enable the western expansion of the railroads as they moved through Indian territories. During his command time frame, General George Custer was defeated at the Battle of Little Big Horn. He later retired from army life and settled in New York City where he enjoyed attending theater, painting and giving speeches. He died February 14, 1891.